Tormented by the way your work fills your time? Perhaps you should consider doing something different. 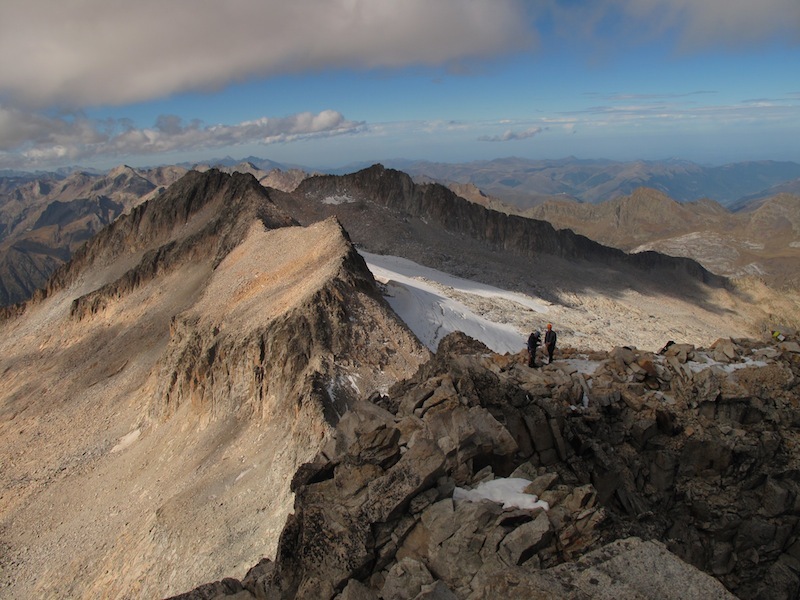 Insights from zen philosopher Alan Watts and humanistic psychologist Abraham Maslow are woven through a narrative describing the author’s ascent of Pico de Aneto, the highest peak in the Pyrenees. The climb provides a vehicle for a reflection on human motivation and on how best to seek satisfaction in modern life and work. The train crawled south past Dalwhinnie. A fleeting glimpse of a squall on the surface of Loch Ericht, cast in a peach glow by the setting sun, caused me to question my motivations. To leave Scotland is to turn one’s back on great beauty. I could have been at Culra bothy before the train arrived in Glasgow, on the summit of Ben Alder before my plane left. Why, with so many ambitions to achieve locally, was I bound for the Spanish Pyrenees? Darkness fell, quieting the call of the landscape. I settled down into the journey with beer and book. I was not just moving from place to place, changing my geographical location. I was shrugging off my everyday existence, undergoing a contextual shift from salaryman and family man to traveller and mountaineer. I hurried through Glasgow’s imperial splendour, a tourist in a place I once called home. Clouds of tobacco smoke and barroom chatter reactivated mental pathways underused since I left the city. I stifled the resulting urge to buy cigarettes and head to a nightclub and pressed on, connecting with my low level train to the northern suburbs with a minute to spare. Schoolgirls – or perhaps students – filled the carriage with laughter. Realising myself to be twenty years their senior I slipped into a reverie. What had been done with those decades? So much. And yet so little. Colin, the elder statesman of our group, a man with more hair in his ears than on his head, collected me from the station and whisked me to his home for a few hours of borrowed domesticity. Come morning we discharged the remaining members of the team, Dan and Mike, from their respective families and drove to Prestwick Airport, its front emblazoned with the cringe-inducing logo ‘Pure Dead Brilliant’. Inside we consumed – enjoyed being perhaps too strong a word – a breakfast and pint at the Elvis Bar, an oasis of shabby kitsch, where blue-tinged portraits celebrate the King’s brief touchdown in 1960. Barcelona is over eleven hundred miles and sixteen degrees of latitude south of my home in Inverness. We disembarked into an October afternoon that was easily the warmest day of my year, collected a hire car and started the long drive to the mountain town of Benasque. We traversed the arid, dusty landscape of post-harvest Spain, its empty fields cut into terraces for ease of irrigation. Decrepit, crumbling villages smeared themselves over small hills. Pigeons emerged from broken windows and cracked walls, the buildings more guano repositories than homes. Halfway we stopped at a service station in a deserted town, parked on a patch of waste ground with a strong smell of urine, changed drivers, and bought unrefrigerated beer. As we got closer to the mountains the scenery changed. The roads narrowed. Limestone walls soared above. The scent of pine filled the car. We were somewhere different, somewhere special. My mind wandered back to the previous night’s train journey and realised how easy it is to become enchained in what is nearby. I leant back in the car seat and allowed a rush of euphoria to wash over me. I had stepped outside my rut. Literally speaking, a rut is a long, deep track made by the repeated passage of wheeled vehicles. Once a rut has been cut it is far easier to follow it than to take another path, hence the word’s figurative definition: a settled or established habit or course of action, especially one that is boring. The peculiar thing about ruts is how comfortable and comforting they can be; how rarely one actually feels stuck or trapped. The metaphor is a good one – a rut by definition being much deeper than it is wide. When within a rut one sees only the high walls, one has to stretch one’s neck to even catch a glimpse of the light above. Only from the bright open space above can one’s rut be seen for what it really is – deep, dark and narrow. There could be no doubt that here, speeding through the Spanish countryside, with fresh territory parading past my eyes, triggering fresh thoughts in my imagination, I had well an truly left my classical rut: work, eating, sleeping. But the same would have been true had I alighted from my train the previous night at Dalwhinnie and marched down the side of Loch Ericht in the gathering twilight. This meant that, when compared to my present situation, even my full and varied life in Scotland, where basic functions and employment are accentuated by family and hobbies and made broader, fuller, is still a form of rut. Life is a series of ruts within ruts, each one wider than the one below, such that it is possible to broaden one’s horizons by swapping one rut for another, wider version. Or, conversely, one might stray too close the edge and tumble into a deeper, gloomier chasm. In the early evening we arrived in Benasque, a maze of medieval alleyways skirted by a road leading nowhere, deposited our possessions in our lodgings and headed into town. With the next day being Sunday and Spain being a catholic country it was essential to purchase gas and hill food before relaxing. We sat outside a bar, warm in our jumpers ten metres below the height of Ben Alder’s summit on an October evening, surrounded by carrier bags containing a hastily selected range of confectionary products, biscuits and crisps. Back at the hotel we packed our bags to a backdrop of televised bullfighting. I passed a restless night, waking frequently, troubled by alternating, contradictory concerns: that my bag would be too heavy or that I had packed insufficient clothes; that we had brought insufficient climbing hardware or that our chosen route would be too easy. I offered myself whatever reassurance was required: it wasn’t winter; the route was no more than a hillwalk; the glacier wouldn’t be much more than a snow patch; then drifted off to sleep once more. It was a relief in the morning to leave the car at the trailhead, shoulder our packs and set off up the mountain. Purple crocus flutes, the harbinger of spring, spread incongruously beneath golden leaved birch. We ascended steadily the short distance to Refugio de la Renclusa, a mountain hostel at an altitude of 2140 m which was to be our base for the night. After a small group of French climbers left to descend to the road I thought we outnumbered the staff, but on glancing outside I noticed the cook’s young son, playing with the resident donkeys. We ordered a lunch of a strained vegetable stock and stale bread, then set off to acclimatise to altitude on Pico de Alba. It seemed appropriate that we had come from Alba, to climb Alba, the peak of the dawn. Just above the hut, a sharp animal call stopped us in our tracks. We saw a fat marmot above us, indignant that we had interrupted his frantic foraging. Continuously vocalising, he scurried beneath a boulder and eyed us imperiously, white front teeth glinting in the gloomy interior. We ascended steadily beside a mountain stream. Peaks of limestone, one striped with a distinctive dark layer, rose above. After passing a delightful lochan with short flat grass for camping we met a boulderfield that marked the terminal moraine of a long gone glacier. The boulders were of rough granite, carried from the high tops to which we were bound. We ascended steadily, following cairns, keeping a close eye out for an appropriate path up onto the ridge. Having started relatively late in the day we met two parties descending from Pico de Alba. Both mentioned a post that marked the best line of ascent onto the ridge. When we found ourselves standing in knee deep snow at the base of the imposing summit buttress we realised that we must have missed it. Rather than descend, Dan and I scrambled up different lines on blocky granite to see if we could prospect a route. Soon we found a long, extremely exposed slab, soaring above us. It looked to have holds all the way up and Dan set off. It certainly wasn’t ground that I would choose to down climb so I waited until he had reached the top and offered his assurance that he was in fact on the ridge. My arousal levels at this stage were high, partly due to the effects of the thin mountain air which always gives me a rushy sensation and partly due to a mix of fear and apprehension that had been rising since we hit the snow and it became clear that this was much more than a hillwalk. I committed to the slab and was soon enjoying the climbing, expressing my delight to Mike and Colin who were following behind. We followed the crest of the sensationally exposed ridge to gain the compact summit, adorned with ragged prayer flags. The air was still, with light cloud shifting atmospherically beneath us, framing expansive views. We lingered, enjoying the buzz that results from being scared enough to focus completely, to live entirely in the moment, and yet finding that despite a short layoff we still had it in us, our dormant skills and experience dredged up from the recesses of our brains and muscles and put to work. What Dan meant was that we had sufficient self knowledge to realise that climbing mountains made us happy, and the drive to get up and do it. In doing so we had self-actualised. Maslow estimated that only a tiny minority, less than one percent of the adult population, actually engage in self actualisation. Some do not have the opportunity, being preoccupied by their basic needs; hunger or self-esteem. Others could in principle self-actualise but are held back by self-destructive urges that Maslow termed meta-pathologies. This concept of self actualisation has been misappropriated as a hedonist’s charter. If one’s fundamental drive is to get drunk, acting on this urge can in no way be described as self actualisation. To fit the definition the drive must be creative or constructive, outwith the self. Climbing mountains may or may not be self-actualising. Some climb purely for kicks. Self-esteem motivates others, they want to earn the admiration of their peers, to prove themselves equal to others who have climbed the same route. Others climb for the aesthetics of the line of ascent, for the mental state it induces, or as inspiration for art. Maslow’s hierarchy of needs struck a chord with me as a way of rationalising not just the feeling of peace that I felt descending from Pico de Alba, but also the non-specific malaise that infuses contemporary society, the feelings of angst that the modern system of work precipitates in many of us. The man engaged in corporate work may have all his basic needs satisfied, thus meeting the preconditions for self-actualisation, and yet find his opportunities for self-actualisation so limited by the demands that it places on his time that it gives rise to perpetual feeling of discontent. This knowledge that the very work that sustains us, that allows us to meet our basic needs, is a form of meta-pathology, creates a feeling of deep conflict. As we sit at our desks we know that time that could have been devoted to self-actualisation is slipping past, never to be regained. Just as a hungry man will think of nothing but food, a man deprived of the ability to self-actualise will think of nothing else, to his detriment. This angst must seem such a petty concern to anyone struggling to satisfy their basic physiological or safety needs, or to anyone tormented by loneliness or feelings of personal inadequacy. A man, or at at least most men, must work. The pinnacle of the human condition therefore is to self-actualise through that work, in which by work I mean more accurately day to day activities or lifestyle. For it is only through self actualisation that the sensation of time passing may be quieted. Staying in mountain huts sounds romantic, but it is seldom restful. To the unacclimatised, the thin air gives a drug like rush, a tingling of the spine, a sense of heightened awareness. A first night in a hut is often like trying to sleep after consuming a stimulant, the mind races, one drifts off only to wake with a pressing thought that demands attention, after this thought has been dismissed it is necessary to instruct the mind to sleep once again. The hut wasn’t warm by any means, but I was hot inside my sleeping bag, the half length zip of which prevented me from using it like a duvet. I woke frequently, pre-occupied by my sweaty knee pits, concerned about moisture seeping into my bag and dampening the down. The warden had briefed us on the breakfast arrangements when we settled our bill after dinner. The staff would leave out breakfast materials, including coffee and milk, which we could heat in the microwave. We rose earlier than intended, all having slept lightly and been woken by a party of Frenchmen who rose before us. On reaching the breakfast room I opened the microwave and was perplexed to find both coffee and milk inside. I removed both and inserted my coffee. Nothing happened. Puzzled, I sat and started my sugary breakfast of biscuit, cake and crackerbread, washed down with orange juice. The lights came on. I was wearing a head torch and hadn’t noticed that they were off. The microwave switched on, turned twice then stopped, accompanied by a bleeping from behind the metal shutters that separated the kitchen from the dining area. Slowly it dawned on me that the microwave was tripping out the power. I fetched my gas stove and boiled up some coffee. Soon the others joined me. After filling our cups Mike noted that there was some hot coffee left and offered it, in English amplified by three years at Oxford, to the lone Spaniard who was our only dining companion. The Spaniard stared at this former pugilist, whose cropped hair and scarred face lent him the appearance of an off duty bouncer. His uncomprehending mask turned slowly to one of alarm as Mike towered over him, blinding him with his torch beam. When Mike bellowed “Coffee” at him one final time the penny dropped and he offered forth his mug. We packed up and headed out into the dark, the steepness of the initial ascent illustrated by the torch beams of the French party high above us. The rays of the rising sun cast the distant peaks in pink, bringing the landscape to life. We ascended rough tracks to a seemingly endless boulderfield. Cliffs towered above us. On the other side lay the Aneto glacier and the highest summit of the Pyrenees. We had prospected the route from Alba and had matched the features to Colin’s insistence that we must take the second notch rather than the first. We gained the ridge below the second notch. Our delight at seeing the summit of Aneto for the first time was tempered by the realisation that we had successfully navigated to the wrong notch. The right one was about 200 m below. After some deliberation and debate we descended the clean granite of the ridge, discarding those hard won metres. It was hot on the sheltered side of the ridge and as we boulder-hopped to the glacier we saw the other side of the high notch to which we had been heading. It looked too hard to down-climb and too long to abseil with one rope. Fatigue made it hard to balance on the boulders. We stopped at the edge of the glacier where a meltwater stream tumbled into an ice-clogged pool. The glacier had a thin coating of fresh snow. Mike and I were keen for us all to tie into the rope lest it be crevassed higher up. Dan and Colin were more reluctant, fearful of being roped together on a snowfield with no protection between; if anyone slipped they could carry us all away with them. On steeper ground I would have agreed, but on an easy angled glacier it was the prospect of one of us falling through a hidden snow bridge, slushy in the sun, that worried me more. The rope would prevent a long fall and facilitate retrieval. We roped up. I led us off at a steady pace. There was some criticism of Colin who had brought antique crampons with buckled straps. They fell off as soon as he started walking. He initially refused to put them back on as the going was flat and the fresh snow made the going easy, but bowed to pressure when the terrain steepened. We were all glad of the chance to catch our breath. We ascended to the bergschrund and traversed below its lip to the Col de Coronas. Round the corner lay the upper snowfield and the summit buttress. Despite the glacier, Aneto is not remotely technical save for the final fifty metres, the Paso de Mahoma or Path of Mohammed, so named because of a Muslim legend that says that the entrance to Paradise is as narrow as the blade of a scimitar, on which only the righteous may pass. I had carefully avoided studying the route in advance and the Path had morphed in my head into a sharp, steep fin of rock. I was more relieved than disappointed to find instead a relatively level section of extremely exposed but straightforward scrambling. When on a summit in fine weather I don’t want to leave. 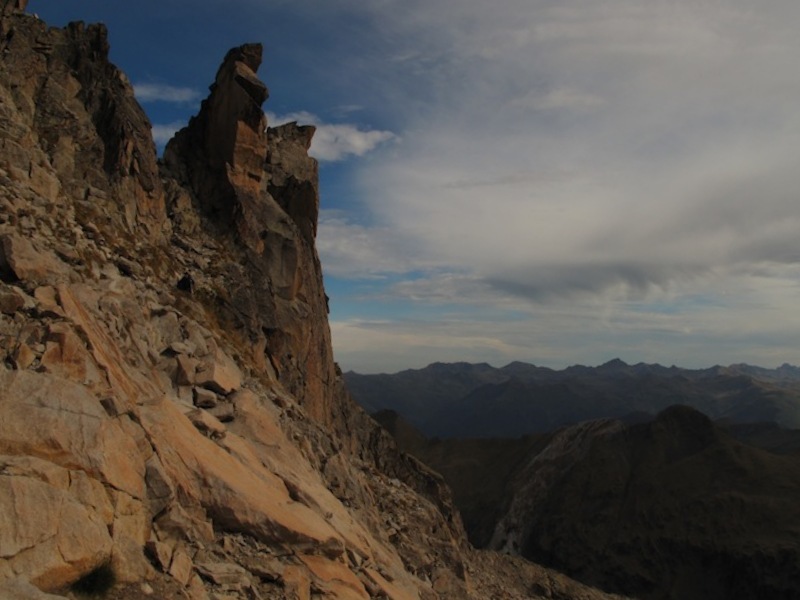 Standing on the summit of Pico de Aneto I could think of nothing but the joys of easy routes on big mountains, of the number of mountain ranges as yet unexplored, of the shortness of life. An ominous layer of grey cloud was fast approaching from the south, directing my attention to the descent. Rather than descend the glacier and return to Renclusa we had carried overnight kit; sleeping bags and mats, stoves and food and – most importantly – a bottle of whisky, so that we might descend the southern face of the mountain and pass the night in the Coronas Refugio, an unserviced, unwardened bothy, saving the walk out to the road for the following day. This was the antithesis of lightweight – our ascent of Aneto would have been much easier and faster without the additional weight – but it made our outing into a satisfying and aesthetic traverse that revealed both sides of the mountain. First we would descend blocks and scree to a pair of bewitching turquoise lakes in the coire below. Beyond the lakes grass began to colour the landscape and a descent into a further coire led to the tree line. All in all we had fifteen hundred metres of steep, rocky ground to cover. This was more than a descent from a mountain; it was a metaphorical descent into the chasm of work. Every step from now on would be a step closer to a desk. It was hard, but necessary, for without the money that work provides how would one fund the next trip? I moved away as the others fiddled with their equipment, keen to get a head start lest my knee slowed me later on. I mulled over yesterday’s discussion about Maslow and self-actualisation, bringing into sharp focus the degree to which I feel conflicted by modern corporate work. I appreciate the rewards but feel ill at ease with the deal I have struck, for I am after all trading all that I have – the time that comprises my finite life – for money, ultimately so that a corporation can make much, much more money. I thought of Zen philosopher Alan Watts, a populariser of eastern philosophy who wrote and lectured prolifically throughout his life and died before I was born. Contemporary film-makers augment their work with his engaging, humourous words, making his wisdom accessible on Youtube to anyone with three minutes to spare. He condemned the values that underpin the modern system of education and work. But he does more than point out the faults, he goes on to provide a solution. Though he does not use the term, the solution he advocates is self actualisation. Watts lamented that our education system is a sequential process, with the aim of turning children into ‘successful’ adults. Such an approach engenders a box-ticking mentality in which the primary objective of any activity is to permit progress to the next. This educational conveyor belt carries the child through nursery, primary one, primary two, secondary school and so on into adulthood and maybe onto university and post-graduate education. Often the individual emerges none the wiser as to what they really want to do with their life, but thoroughly conditioned into the sequential completion of tasks. Money tempts them into employment and once the concept of exchanging time for money takes hold it is all too easy to accept that work’s only purpose is the procurement of money. This type of attitude asks not what is the most enjoyable occupation; rather it asks which is the highest paid. It dooms its adherents to spend their lives doing things that they don’t like doing just to go on living, that is to go on doing things that they don’t like doing. Watts’ advice was to think deeply about one’s individual desires, what one would do if money were no object. He cautioned against hiding behind the lazy received wisdom that nobody ever made a decent living by writing or painting or otherwise pursuing their dreams. He reasoned that, no matter what one is interested in, other people are too. So by doing enough of that thing, whatever it may be, one will become a master of it, able to command a good fee. I had always though of life choices in terms of choosing between opting in and dropping out, between a life of impoverished leisure and one of lucrative drudgery. Watts points out that there is a middle way. He is not advocating laziness or poverty, instead he proposes self actualisation, following one’s passions wholeheartedly without initial regard for money, relying on the value of commitment to look after the details. What Watts didn’t say, perhaps because his material was aimed at self-selecting audience, was that his words only apply to a tiny subset of the population, the same group that Maslow judged to be capable of self actualisation. Self actualised individuals are often lone operators and free thinkers, unconcerned with mass behaviour. Maslow produced a list of characteristics common to self-actualisers, among which he included the frequent occurrence of peak experiences, temporary moments of self-actualisation marked by feelings of ecstasy, harmony and deep meaning. One of the individuals that Maslow is said to have regarded as being self-actualised was an earlier American psychologist, William James, who limited his study of the psychology of religion to mystics who had profound and real religious experiences and who, in communicating these incidents to others, gave rise to the second-hand religion of the ordinary believer, characterised by fixed forms of imitation and retained by habit. I draw a similar distinction between modern corporate work and true, self-actualising work that satisfies a fundamental drive of the individual. What is required by most modern work is no more than imitation: the deliberate but mindless exhibition of organisationally prescribed behaviours until they become ingrained, subsuming their host. The surest way to progress is through imitation of one’s superiors, even if their behaviour is clearly neither wise nor in tune with one’s own drives. Most function and define themselves primarily through imitation. They do not feel their time being wasted in exchange for money because they cannot conceive of any alternative to organised work. 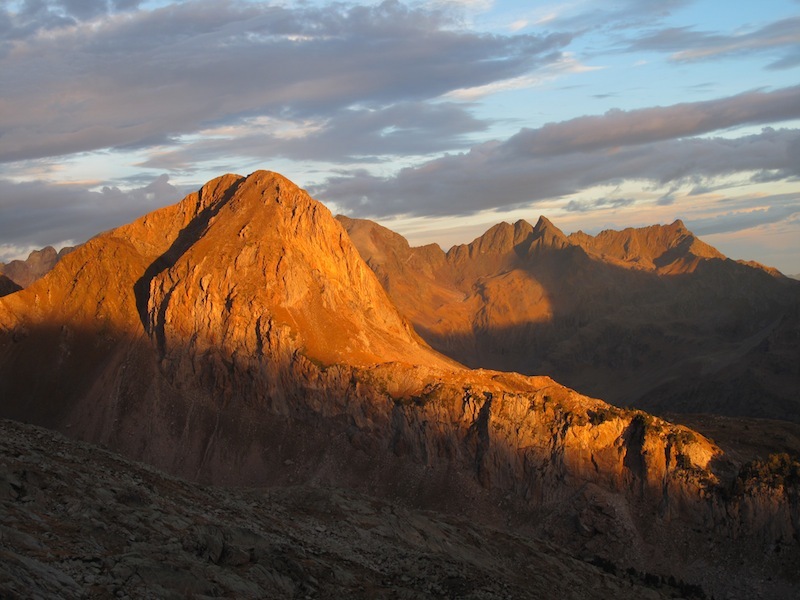 By the time we hit the main trail and turned left towards the Refugio de Coronas the light was fading fast, the descending dusk accelerated by shading trees. We strode steadily, preoccupied by base needs for food and shelter. The hut’s silhouette appeared abruptly to our left. Inside was a two-tiered sleeping platform, a hearth and a table with benches. I fried chorizo and boiled noodles, mixing the two and passing half to Dan. Colin and Mike entered as we started to eat. Silence reigned as we replenished our bodies after a long day. The hut was located at the confluence of two rivers, constraining the terrain available for both wood hunting and for defecation. We found both the right and the wrong types of logs, and having gathered sufficient dead wood for a fire, laboriously chopped it using an ice axe. While the fire got going we sat outside, comfortably reclined on a bench fashioned from a large tree trunk from which a one hundred and twenty degree wedge had been removed. We savoured the whisky that I had carried over the mountain and shared three cigarettes, passing them like joints. The night was clear and the Milky Way stretched across the sky, I felt reacquainted with an old friend, not having seen it during the light northern summer months. Spectacular yellow meteors streaked across the sky; pieces of space rock burning up in the atmosphere. Every October the Earth passes through a cloud of debris left behind by Halley’s comet. The comet visits the earth every seventy five years or so, but even when it is thirty years away, at the very edge of the solar system, we receive its calling cards in the form of the Orionid meteor shower. Parallels exist between this comet dust, suspended in space, invisible until the Earth’s atmosphere provides the oxygen necessary to reveal it to human eyes, and the ideas that great thinkers leave in their wakes, spread throughout time. These ideas remain in darkness until the oxygen of imagination allows them to burn brightly for a short time, casting their light into the minds of others, and by that light we may see a little deeper into the human condition, and into our own. I came to climb mountains but took home self knowledge and revelations about contemporary work. What I found up there amid the snow and granite of the Pyrenean summits was an understanding of precisely why modern work can be such a dissatisfying experience, it is because though it satisfies my basic needs it does not provide sufficient opportunity for self actualisation. Furthermore I understood that my feeling is a relatively rare one, and that this discontent does not arise because of a bad attitude; everyone else appears more able to tolerate work not because work is good, but because they do not feel the desire to self-actualise, and are consequently not tormented by the way work fills their time. Alan Watts’ sage advice tells me what to do about it – those of us fortunate enough to have a strong desire owe it to themselves to identify exactly what that desire is and to follow it wholeheartedly. In the morning, as we crunched our way down the Valle de Coronas, I reflected that while I had been absorbed in the moment, the sense of the passing of time, or at least of time being wasted, was entirely absent. As I got closer to the car, hotel and finally our homes I could feel trivia infiltrating my mind once more. Climbing real mountains is easy. Escaping the rut of organised work is much harder but it may be the only way to quiet the noise of all that time, rushing past at an ever increasing rate. Why oh why do people slog up Aneto– a long and boring walk filled with huge numbers of “highest mountain in the range” aspirants slogging up the same hill in trainers (with crampons no less) and useless dangling ice axes that they have absolutely no idea how to use let alone carry when there are much fine mountains a couple of metres lower next door? where you might fine airy technical mountaineering at all grades consistently interesting beautiful and engaging without another soul to bother you. Still I suppose the value of Aneto is to make Benasque and the associated huts and buses a viable commercial venture so that these other mountains may be enjoyed! Each to their own? I can see how sharing the route with hordes of fuds would detract from the experience, but Aneto is very quiet in October and the traverse is a fine expedition. Perhaps my glasses were rose tinted because I found Benasque to be a charming town in which to enjoy a few beers rather than merely a viable commercial venture!